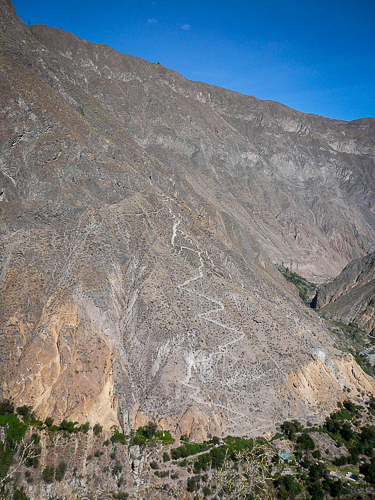 We start the Colca Canyon trek descent in the early afternoon. A dusty, rocky, steep trail that switchbacks down the 1000 meters to the bottom. One thousand meters…that’s one kilometer straight down. 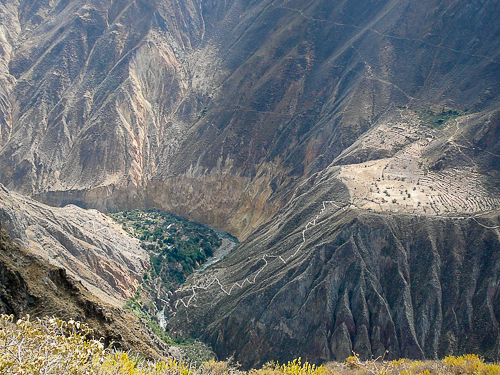 After climbing the heights of Dead Woman’s Pass on the Inca Trail, there was nowhere to go but down…to the bottom of the deepest canyon in the world…Colca Canyon. Okay, full disclosure…there is a deeper canyon (by about 40 metres) but it’s a little further away and more difficult to get to…for my purposes, this is the deepest. 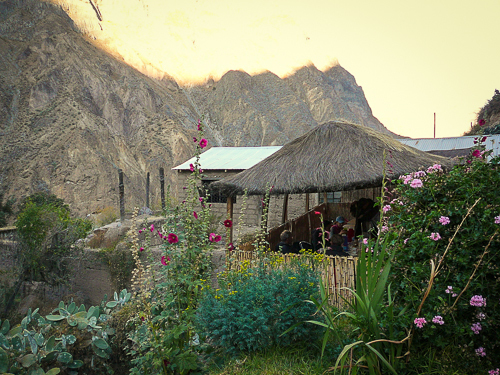 The top of the canyon is dry, scrubby desert…the bottom holds the Colca River and is warmer and lusher. We reach the bottom inn about 3 hours and are impressed by the bamboo dining hut and adobe buildings that will be our home for the night. I’m even more impressed by the beer that is available as the only way in and out of the canyon is by the trails that zigzag the walls – there are no cars here, only donkeys to help with transportation. But tourism is a major industry here and tourists like beer…so beer is brought down. The next day is even more impressive as we hike along the bottom of the canyon to reach the oasis a couple of hours away. 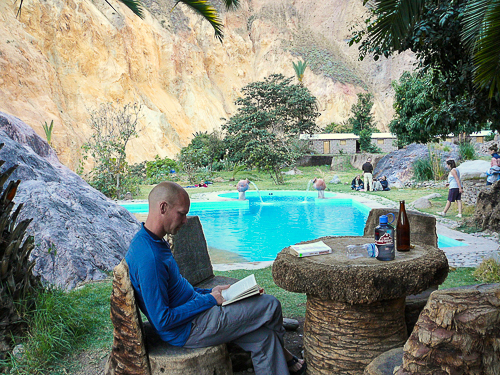 Here there are terraces of adobe and bamboo huts, palm trees and…swimming pools! The spaces between the huge boulders littering the site have been dammed and swimming pools created. It is a hot, sunny day…we waste no time in digging out our swimming togs and claiming a spot by the pool for the afternoon. Our first summer-like activity since leaving home. The next day starts before dawn for us as we start the hike back up in the dark to avoid baking in the sun. I have said that I think we can do it in two hours and so we set a pace to try. Zig, zag, zig, zag, zig, zag…up and up we go, slowly reeling people in and passing and we trudge slowly toward the top. One thing we have going for us this time is that we are not at nearly the altitude we were for Dead Woman’s Pass a few weeks earlier so our lungs and heart are not protesting nearly as loudly. We crested the top at one hour and fifty eight minutes. Pretty happy. Trekking the canyon was cool. Seeing people living there makes me wonder how they do it…up and down those trails so often. Our guide, Patricia, says that the locals can make it up the trail in 45 minutes…seriously, that is impressive! Sounds like such a wonderful day! The pictures are stunning. Sounds like a good spot for Erin’s Bootcamp! Wow, what an amazing trek! I just found your blog via AlmostFearless, and am so glad I did. My husband and I (also with no kids) have thought about doing a long journey, so I will be following your blog closely. Sweet flippin’ pools! The treks you two take are awesome!